Happy Hump-day! 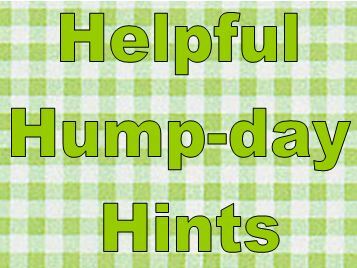 Here are my Helpful Hump-day Hints for today! Check out all of these ways to jump start your spring cleaning and get organized! All from FamilyEducation.com. I get emails from this website which include activities for your kids, managing your home, family finances, and much, much more! Hope you enjoy these lists and that they are helpful. Explore the whole site and see what will help you and your family get organized this spring. Hope you had a nice Hump-day! We are SO close to the 400th comment – let me know how you are getting organized for spring and maybe you’ll win the prize!